Writer Stuart Moore and artist Gus Storms have shown a talent for combining team-based superheroics with sci-fi spectacle in their ongoing Image Comics series EGOs, making them an inspired choice of creative team for the two-part Convergence: Superboy And The Legion Of Super-Heroes miniseries. 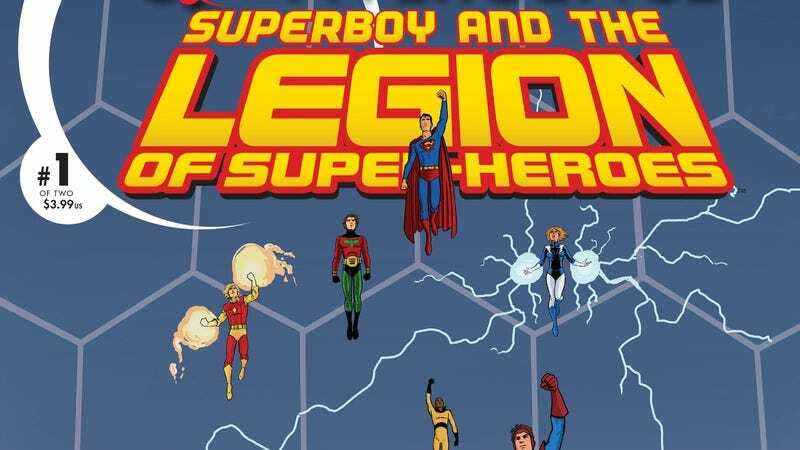 What makes this project especially notable is the absence of the Legion of Super-Heroes in DC’s current stable of ongoing comics, making this the only place for fans of the Legion to see these characters for the foreseeable future. There’s a lot of potential to be explored in this property, and the strength of Moore and Storms’ creator-owned work suggests that they’re the right people to realize that potential. Moore has a knack for building complex character dynamics and dramatic stakes without sacrificing fun and humor, and Storms’ clean, expressive linework is a great fit for Moore’s scripting. Veteran inker Mark Farmer brings a smoothness to the visuals that aligns it with the art of mid-’80s DC Comics, and colorist John Rauch uses a vibrant palette to create a brighter mood for this series than Moore and Storms’ EGOs. The presence of Superboy introduces an optimism and sincerity that the creators downplay in the fraught world of their creator-owned series, and the visuals reflect that shift in tone. This is a smart team, and if DC is planning a Legion revival, it doesn’t have to look far for ideal creators.